In the light of a Facebook post from my Mum two weeks ago, celebrating 61 years of living in Australia, I’ve been prompted to share this history, which is part of my life and culture. My maternal grandparents both died when I was very young and I have always felt a bit ripped off to not have them share their cultural history with us as kids. I do know that in the lead up to and during the Second World War, they were living in Malta, with five of their six children. As the youngest, my Mum was yet to be born and my Grandparents were up to seven years from leaving Malta to live permanently in Australia. I’ve always thought my Grandparents were so very brave, moving their six children and the only lives they ever knew, to a new country. This was 1951, only a few years after the war finished. This story ends on the 10th of July 1943. Granny probably just found out she was pregnant with Mum; incredible for me to imagine! Having emigrated myself, I know how difficult a move like this can be, let alone with six children! English was widely spoken in Malta during that time, but it was still their second language. It surprises me how my Grandparents survived the war and what was happening to their beloved home country, then decided to leave, when peace arrived. Even though I didn’t know them, I have great admiration for the risk they took. Had they not have done this, my Mother would not have had the love affair of her life with my Dad, my siblings and I would never have been here; I would most certainly not be living in the EU….and so it goes. I was enthralled to read this story. The history of the Siege of Malta is on a stone plaque here in London. I have transcribed the words below. If you don’t know the story, it’s an interesting read. If you do and like me, have part in this brave and courageous culture, you will no doubt be as proud as I am. 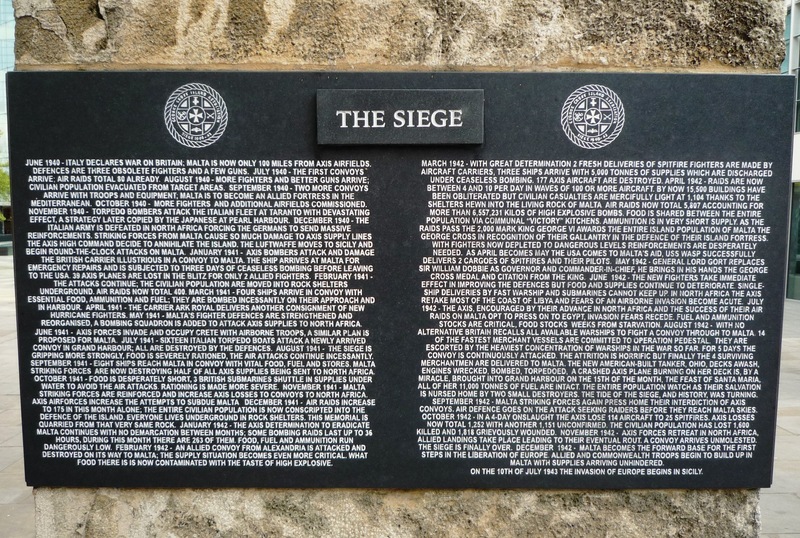 The text on the stone plaque in London commemorating the Siege. Malta GC: The Siege of 1940 -1943. In the sinister shadow of fascism spilled across Europe and into North Africa, Malta under the protection of Great Britain, found herself alone in a hostile Mediterranean 800 miles from her nearest allies in Gibraltar and Alexandria. Besieged by enemies, Malta became a fulcrum on which the fate of the war balanced for the next three years. If Malta fell the rest of North Africa would follow, opening the door to the oil fields of the Middle East and for the Axis powers to join in Asia and threaten India. The allies knew this, so did the Axis powers. Malta, besieged, became and remains the most bombed place in the history of war. Supplied only by sea, at great cost, Malta was defended not only by her own people but also by forces drawn from the whole free world. Figther aircraft delivered by the American and Royal Navies were piloted by Britons, Canadians, Australians and New Zealanders. Convoys crewed by British, American and Commonwealth seamen were supported by the free forces of Greece, The Netherlands and Poland. Free Norwegians added their merchant fleet to the allied cause. In April 1942 King George VI awarded to the people of Malta, the George Cross, the highest decoration for civilian courage and heroism. By summer 1942 only weeks of food remained and the Allies mounted Operation Pedestal as a last attempt to save Malta. After a five-day running battle the convoy’s four remaining merchant vessels and the immortal tanker Ohio, all that was left of the fourteen that set out, entered Grand Harbour. The date was 15th August 1942. The Feast of Santa Maria. The siege was broken. Within months North Africa was retaken and the first steps of European Liberation begun. The stone this text is from, was taken from Malta and presented by the Maltese Government on the 60th anniversary of the end of the Second World War to commemorate all who participated in the siege and defence of Malta, 1940-43. Italy declares war on Britain. Malta is now only 100 miles from Axis Airfields. Defences are three obsolete fighters and a few guns. The first convoys arrive. Air raids total 80 already. More fighters and better guns arrive; civilian population evacuated from target areas. Two more convoys arrive with troops and equipment; Malta is to become an allied fortress in the Mediterranean. More fighters and additional airfields commissioned. Torpedo bombers attack the Italian fleet at Taranto with devastating effect, a strategy later copied by the Japanese at Pearl Harbour. The Italian army is defeated in North Africa forcing the Germans to send massive reinforcements. Striking forces from Malta cause so much damage to axis supply lines the axis high command decide to annihilate the island. The Luftwaffe moves to Sicily and begin round-the-clock attacks on Malta. Axis bombers attack and damage the British carrier Illustrious in a convoy to Malta. The ship arrives at Malta for emergency repairs and is subjected to three days of ceaseless bombing before leaving to the USA. 39 axis planes are lost in the blitz for only 2 allied fighters. The attacks continue; the civilian population are moved into rock shelters underground. Air raids now total 400. Four ships arrive in convoy with essential food, ammunition and fuel; they are bombed incessantly on their approach and in harbour. The carrier Ark Royal delivers another consignment of new Hurricane fighters. Malta’s fighter defences are strengthened and reorganised; a bombing squadron is added to attack axis supplies to North Africa. Axis forces invade and occupy Crete with airborne troops, a similar plan is proposed for Malta. Sixteen Italian torpedo boats attack newly arrived convoy in Grand Harbour; all are destroyed by the defences. The siege is gripping more strongly, food is severely rationed, the air attacks continue incessantly. Eight ships reach Malta in convoy with vital food, fuel and stores. Malta striking forces are now destroying half of all axis supplies being sent to North Africa. Food is desperately short, 3 British submarines shuttle in supplies under water to avoid the air attacks. Rationing is made more severe. Malta striking forces are reinforced and increase axis losses to convoys to North Africa. Axis air forces increase the attempts to subdue Malta. Air raids increase to 175 in this month alone; the entire civilian population is now conscripted into the defence of the island. Everyone lives underground in rock shelters. This memorial is quarried from that very same rock. The axis determination to eradicate Malta continues with no demarcation between months; some bombing raids last up to 36 hours, during this month there are 263 of them. Food fuel and ammunition run dangerously low. An allied convoy from Alexandria is attacked and destroyed on its way to Malta; the supply situation becomes even more critical. What food there is is now contaminated with the taste of high explosive. With great determination, two fresh deliveries of spitfire fighters are made by aircraft carriers. Three ships arrive with 5000 tonnes of supplies which are discharged under ceaseless bombing. 177 axis aircraft are destroyed. Raids are now between 4 and 10 per day in waves of 100 or more aircraft. By now, 15,500 buildings have been obliterated but civilian casualties are mercifully light at 1,104 thanks to the shelters hewn into the living rock of Malta. Air raids now total 5,807 accounting for more than 6,557,231 kilos of high explosive bombs. Food is shared between the entire population via communal “victory” kitchens. Ammunition is in very short supply. As the raids pass the 2000 mark, King George VI awards the entire island population of Malta the George Cross in recognition of their gallantry in the defence of their island fortress. With fighters now depleted to dangerous levels, reinforcements are desperately needed. As April becomes May the USA comes to Malta’s aid, USS Wasp successfully delivers 2 cargoes of Spitfires and their pilots. General Lord Gort replaces Sir William Dobbie as Governor and Commander-in Chief, he brings in his hands the George Cross medal and citation from the King. The new fighters take immediate effect in improving the defences but food and supplies continue to deteriorate. Single-ship deliveries by fast warship and submarines cannot keep up. In North Africa, the axis retake most of the coast of Libya and fears of an airborne invasion become acute. The axis, encouraged by their advance in North Africa and the success of their air raids on Malta opt to press on to Egypt, invasion fears recede. Fuel and ammunition stocks are critical, food stocks weeks from starvation. With no alternative, Britain recalls all available warships to fight a convoy through to Malta. 14 of the fastest merchant vessels are committed to Operation Pedestal. They are escorted by the heaviest concentration of warships in the war so far. For 5 days, the convoy is continuously attacked. The attrition is horrific, but finally the 4 surviving merchantmen are delivered to Malta. The new American-built tanker, Ohio, decks awash, engines wrecked, bombed, torpodoed, a crashed axis plane burning on her deck; is, by a miracle, brought into Grand Harbour on the 15th of the month, the Feast of Santa Maria. All of her 11,000 tonnes of fuel are intact. The entire population watch as their salvation is nursed home by two small destroyers. The tide of the Siege and history, was turning. Malta striking forces again press home their interdiction of axis convoys. Air defence goes on the attack seeking raiders before they reach Malta skies. In a 4 day onslaight, the axis lose 114 aircraft to 25 Spitfires. Axis losses now total 1,252 with another 1,151 unconfirmed. The civilian populaton has lost 1,600 killed and 1,818 grievously wonunded. Axis forces retreat in North Africa, allied landings take place, leading to their eventual rout. A convoy arrives unmolested. The siege is finally over. Malta becomes the forward base for the first steps in the liberation of Europe. Allied and Commonwealth troops begin to build up in Malta with supplies arriving unhindered. On the 10th of July 1943, the invasions of Europe begins in Sicily.